In the month of November, 1850, there were eight primitive houses situated on the extreme point of a little peninsula far projecting into the Bay of San Francisco. It was separated from the surrounding country by a rocky mountain range. The eight houses were occupied by an American hunter and seven French fisherman, deserters from a French man-of-war. On the opposite side was another French settlement of five fishermen. The only livestock owned by the two settlements was a single goat, the loss of which would have proved a public calamity. Its master had brought it from France, around Cape Horn. Besides the hunting and fishing people, there was, beyond these settlements, a regular farmer called the Irish Captain, although he was neither Irish nor a captain. He was a Dane by birth and a farmer all his life by occupation. He possessed a valuable stock of imported cattle – a rare thing at that time. Further into the interior, on the other side of the mountain range, was the Cornelia Rancho, a California manor house constructed of rough beams, and surrounded by mud and cattle instead of gardens, parks, green grass, and flowers. Cornelia was a native grandee, and claimed the right to four hundred square miles of territory. 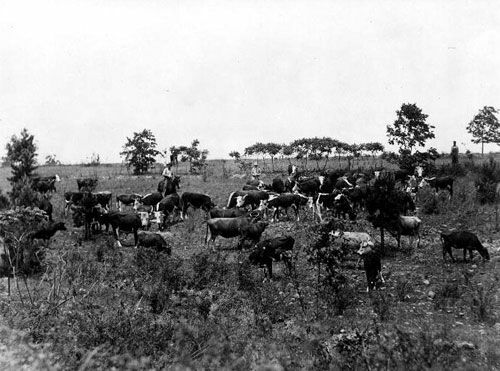 Although the invasion of her country by the gold hunters had swept away the greater part of her herds, there still remained over a thousand head. In full dress, adorned with gold chains, pearls and jewels, she looked very magnificent, seated in a large wagon drawn by two oxen and sixteen mules, roughing it over a country without roads. This, however, was upon state occasions, and of rare occurrence. Her home dress was an old broad-brimmed straw hat, leather boots, a loose white shirt, and a short petticoat of coarse red flannel. She ruled over thirty Indian servants besides her son, twenty-four years of age and a homeless Portuguese adventurer, who seeking a support, had drifted to that Eden before the rude gold hunters dispersed the charm of silence, simplicity, and ignorance that reigned complete everywhere. The Irish Captain was not slow to perceive his advantage over the senora. He therefore proposed to her to take charge of her cattle and sell to the best advantage, on condition that he should have one-half of the sum realized, which proposition was reluctantly accepted by the senora. The Irish Captain now organized for the common defense by calling a general meeting, and binding each by a covenant to take care of his neighbors’ property by armed force when necessary. 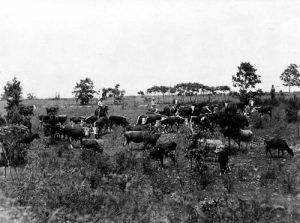 But a short time thereafter a boat laden with stolen beef from the senora’s herds was captured, and the cattle thieves taken prisoners by the Frenchmen of Low Point. The thieves were tied, put under a boat turned upside down, and closely watched. The Irish Captain himself escorted the prisoners to San Francisco the following morning and delivered them into the hands of the civil authorities. Instead of being punished for their lawless crimes, they were set at liberty by the civil authorities, and retaliated upon the Irish Captain by butchering and carrying off all his milk cows. These thieves and this system of robbery received the countenance of rich and influential butchers of San Francisco, who furnished the means for these predatory incursions, and the money to retain influential counsel to defend and acquit, through technicalities of the law, such of the thieves as should fall into the hands of the Irish Captain and his cohorts. Convinced that no redress could be obtained from the civil authorities at San Francisco, a second general meeting was held, and it was unanimously resolved that the residents of the peninsula should form themselves into a permanent committee, and assume all the duties of police and courts martial. No suspected party should be permitted to land. Thieves and other criminals should be tried before the committee, and, if found guilty, executed on the spot. Thus was formed the first Vigilance Committee that ever existed within the limits of California. Within a week three men, who confessed themselves to be Australian convicts, were tried, convicted, and executed by hanging to a tree. Cattle thieves abounded, and retribution swift and sure was meted out whenever the crime could be fixed by the logic of circumstances. Justice and injustice met on a common level. He was not a murderer, but an executor of the law — the unwritten law — against all cattle thieves. If ten men could capture and slay him for the crime, the same right belonged to but one of the party, provided he alone could accomplish it. Pressed by these vigorous methods, the thieves and robbers in the country retired to the larger towns and settlements to ply their vocation. Popular justice there was neither so swift nor so sure. Public opinion, however, opposed any infringement of the rights and methods of the civil authorities. What five men could do in the country, five hundred could not accomplish in San Francisco or Sacramento. 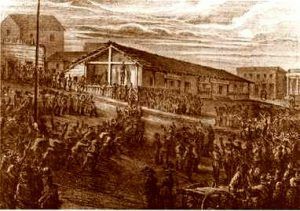 Sacramento was the first of the large towns to organize a committee of its citizens for the protection of social order, and its executions became celebrated for the interest displayed in them by the people of the surrounding country. The first of these was at night on the Plaza, in the light of a great fire and in the presence of a great multitude. The office of hangman was conceded as a post of honor to the most reputable and wealthy citizen of the town. Two days after, he paid the penalty of this honor by being himself shot by the desperadoes. John Jenkins lynched for stealing about $50 in coins. The Daily Alta California newspaper is just to the left of the cross-like structure where Jenkins hangs. San Francisco seemed loath to begin the exercise of this inherent power of the people; but the great incendiary fire of May 4, 1851, and the appeals of the Alta California and California Herald, which declared that nothing could disturb the culprits equanimity but the extreme measure of banging by the neck, caused a revulsion of feeling, and early in the month of June following two hundred of its most influential citizens formed an association, which they named a Committee of Vigilance, for the maintenance of the peace and good order of society and the preservation of the lives and property of the citizens of San Francisco.